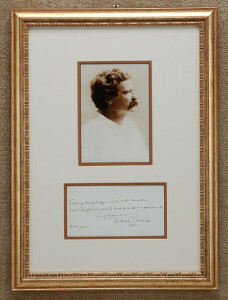 Mark Twain’s signatures, autographs, and signed letters are among the most popular of all American personalities. Fortunately for admirers, fans, and collectors, Mark Twain autographs, signatures, and signed letters were coveted from the time people first knew of him through his writings. Samuel L. Clemens, the real name of Mark Twain, was an extremely popular writer and lecturer, and contemporaries prized his autographs, whether a signature on a card sent through the mail or one obtained in person. Everyone knew his name, and everyone prized and saved his autographs. Mark Twain’s signed letters have been aggressively collected by American institutional libraries for most of the 20th century, and by specialized private collectors in recent decades. Nevertheless, interesting and important Mark Twain letters are available at times and always create a lot of interest among collectors. 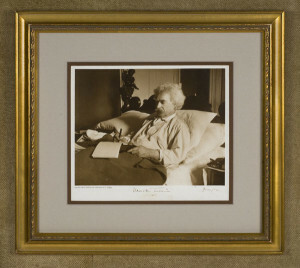 Please browse our selection of Mark Twain autographed memorabilia or you may search our entire inventory alphabetically or by name or by category.